Oh let’s not forget about SPAM! You see, I am a huge fan of hot pot. I’m sure a big reason for it is my time in China and the fact that the last time I ate it was in China, but there is really something special about cooking your own food even if you have to go to a restaurant to do it. And Hunan Bar is all-inclusive so I get all the meat I wanted. It’s an off-white kind of place. 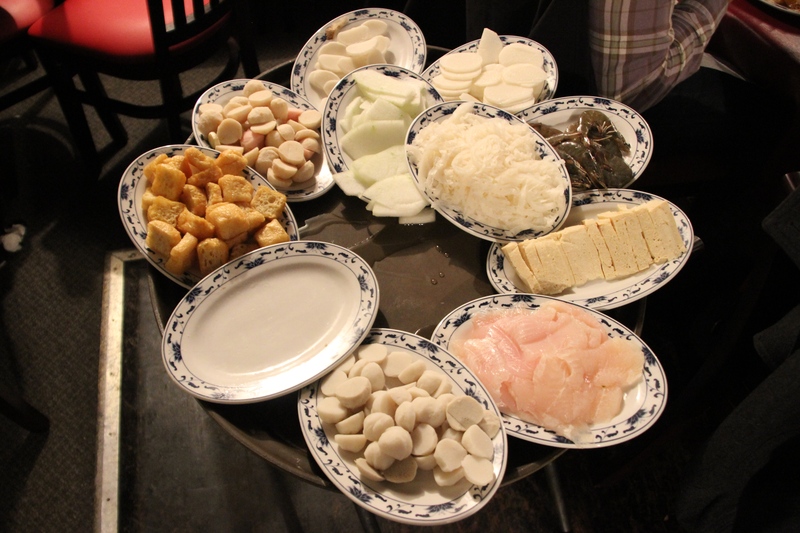 The hot pot at Hunan Bar is very similar to the Chengdu-style I once enjoyed. But with a name like Hunan Bar I did a quick search of the webbies and found Hunan-style hot pot is really quite similar. 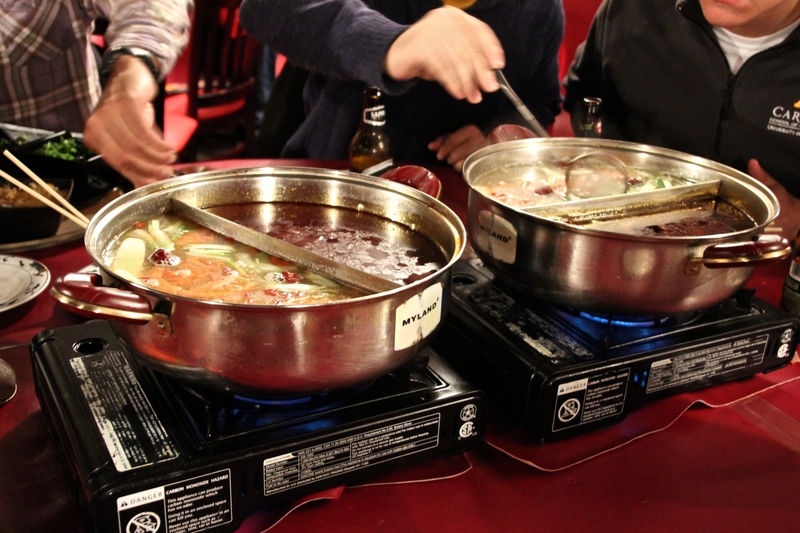 It started with a single hot pot divided in two. One side was for spicy broth and the other for the mild broth. Inside were herbs and seasonings, including the amazing numbing peppers in the hot side. While that came to a boil, we did the ritual mixing sauce to dip our food in. I went with a combination of chilies, sesame paste, cilantro and garlic. As for the main food, we had all sorts of options, including various tofus and vegetables that I could avoid. But there were meats to make up for it, like brisket, lamb, and balls made from assorted animal meats. 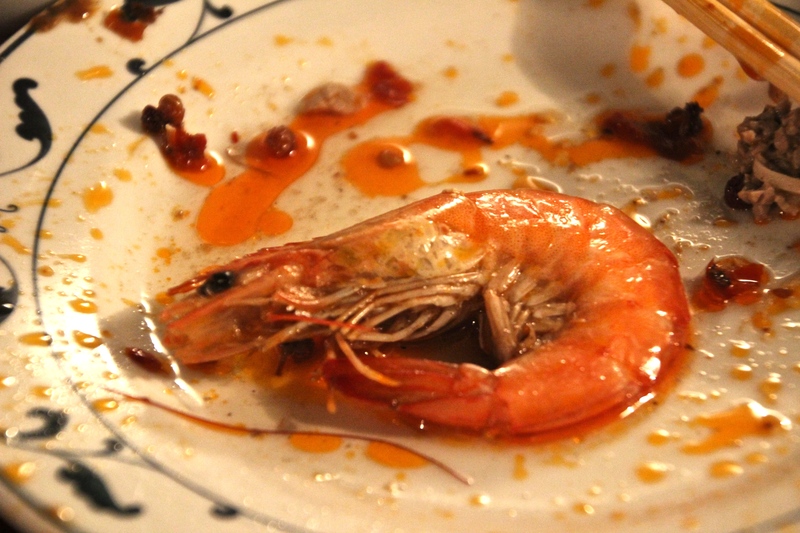 There were even whole shrimp, which I always think are awesome because of the work that goes into pulling out their legs and head. If you can’t tell, I enjoyed my hot pot experience at Hunan Bar. It brought back delicious memories and created some delicious new ones. I wouldn’t have minded a bigger variety of sauce options, but perhaps that is just not the thing to do in Hunan. If only I could find a Sichuan-style hot pot, life would be amazing.